The 1980s started the modern age of American baseball, and at Collectors Corner, we have a huge selection of collectable baseball cards to commemorate the era. Whether you’re looking for something to complement your own collection or you need to find the perfect gift for a baseball lover in your life, you’ll hit a home run with the collectable 1980s baseball cards in our selection. 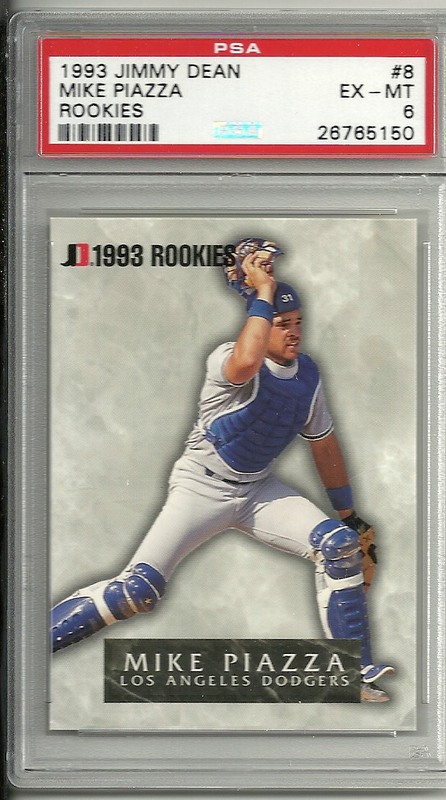 Mike Piazza RC from 1993 Jimmy Dean. It’s tough to choose between all the collectable baseball cards in our selection. We have access to dozens of hard-to-find items, such as 1982 Cal Ripken cards by Topps, 1985 Roger Clemens cards by Fleer and 1986 Jose Canseco cards by Donruss. We can connect you with 1980s-to-present baseball cards featuring heavy hitters like Mark McGwire, Barry Bonds and many more. You’ll find all your favorite modern-day players in our catalog, and if you don’t find the card you’re looking for, simply contact one of our sellers.